The ULTIMATE Organizer For Any Shop! Keep your sign shop organized and efficient! This sturdy floor rack is made of heavy guage wire. Free up floor space and protect your vinyl. 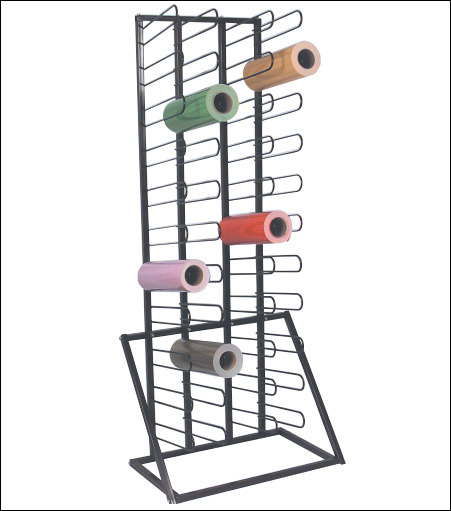 With the Sign-Mart rack, your work area stays clean, well-organized and presentable. Inserted, no-weld roll supports make this floor rack the strongest ever made. Beautiful powder coat finish in black, holds 44 rolls of vinyl (up to 36" x 50 yds), premask or other media on the 14" long heavy duty brackets.